We had a conversation with Sylvia the other night about what we do that is good for the environment. There is so much that we can do for the environment. It is a bit like having another baby with so many needs and so many options. My regrets on activities I didn't offer Sylvia in her preschool years are eased by knowing that I did lots of fun things with her. Likewise I know that I have managed to do some things for the environment if not everything. Little victories. Cooking a lot of food at home to minimise packaging. Using leftovers as much as possible rather than throwing out food. Cycling, walking or taking public transport when possible. Looking after our plants in the backyard. Using our curbside rubbish collection to recycle as much paper, plastic and green waste as possible. We don't have a clothes dryer or a dishwasher. Turning off lights when not in a room. 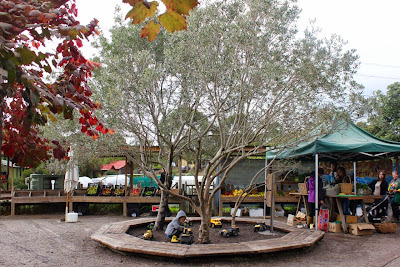 Buying food at farmers markets. A lot of this sounds like common sense to me. 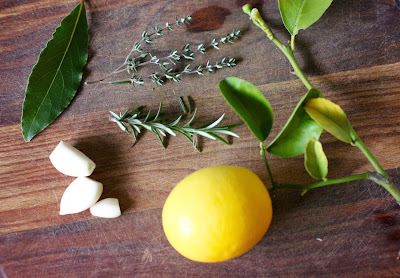 Yet at the same time, today as I shopped at CERES Farmers Market I felt pleased that I am shopping at farmers markets regularly, making my own sourdough bread and growing lemons and limes in my backyard. This is the sort of lifestyle I aspired to as a young adult but just could not imagine. And while I don't have my own water tanks, solar panels and focus on indigenous plants in our yard, I feel like I am making progress with caring for the environment. And being environmentally aware is not all serious and grim. Farmers markets offer lots of interesting locally grown produce. 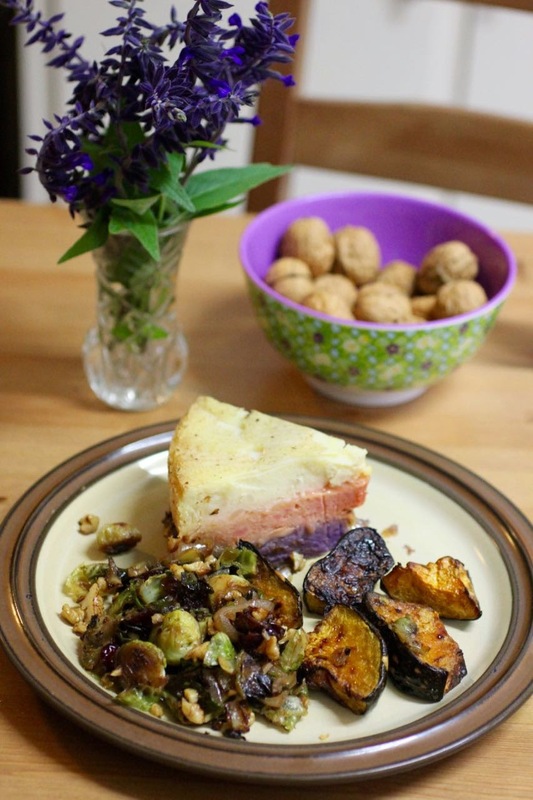 I have recently posted about my fun cooking with purple potatoes. Today I bring you a risotto that features both orange and yellow carrots from the farmers market. I had carrots and feta to use up as well as many lemons on the tree. I really liked the sound of Joanne's risotto with carrots and feta, but Lorraine's 'forget about it three cheeses risotto' seemed a good way to give me a bit of extra time by baking rather than hovering around the stovetop. The salty feta and sweet carrots worked together brilliantly, with just a little extra baking needed so all the water was absorbed. At first I thought perhaps all the feta made it too salty but the final dish was so moreish that I would do it the same all over again. And probably will. 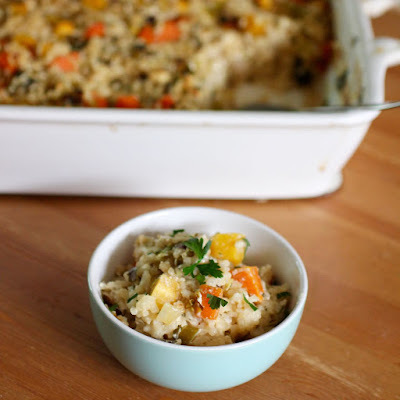 I will also be trying different flavours in baked risottos, this promising to be the first of many. I love listening to Greg Champion of the Coodabeens on the radio when he sings his satirical songs. Today he sang a song about FIFA corruption to the tune of the Monkees I'm a Believer and managed to rhyme "caught in Geneva" with FIFA. It was brilliant. Possibly all the talk of corruption in soccer got Sylvia thinking. She asked if you wear socks to play soccer. Actually it seems that 'soccer' comes from the work as'soc'iation. Tonight I read Sylvia some of the Nancy Drew's The Secret of the Old Clock that she is reading. At one point Nancy Drew had cinnamon cake with apple sauce. Sylvia turned to me and said, that's just like us. It was nice to feel that she felt akin to Nancy Drew for all the good food rather than envious. After all we had chocolate pudding for sweets tonight! I am sending this risotto to Jac for Meat Free Mondays, to Elizabeth's Kitchen for No Waste Food Challenge, to Cindy for Gluten Free Fridays #144, and to Vanesther (and Louise) for the Italian Challenge of the Family Foodies event. Preheat oven to 180 C (or 200 C if you have a slow oven like mine). Fry leek and carrot in oil over medium heat for about 10 to 15 minutes or until carrots are tender. Stir in arborio rice for about 1 minute. Scrape rice mixture into a baking dish (about 9 x 13 inch) and mix with stock, feta, parsley and lemon juice. Cover with foil. The very word sandwich conjures up simplicity and convenience at lunchtime. Which is why I love a good peanut butter sandwich. Yet the best sandwiches take a lot of preparation. The trick is to incorporate foods that are already being made for other purposes. Take these sandwiches for example. I baked a loaf of overnight sourdough bread, I had leftover avocado dressing and I only needed to mix in some vegies to have a great salad sandwich. For those groaning at my industry, I hasten to reassure you that I don't always have a flurry of activity in the kitchen. However it is lovely to feel like a domestic goddess with freshly baked bread and muffins and a home made salad dressing that will make vegetables taste great. I made the dressing yesterday and mixed it through some spinach, carrot, chickpeas and cherry tomatoes for lunch. Today I was inspired by Janie at the Hedgecombers who has challenged bloggers to make sandwiches for the Tea Time Treats event that she runs with Karen of Lavender and Lovage. I am often so lazy about my sandwiches that I appreciate any reason to try harder. I looked through my bookmarks for a sandwich idea that matched my available ingredients, was impressive and required minimal work. 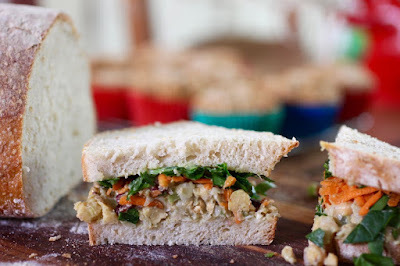 I chose Simple Veganista's Cranberry, walnut, chickpea salad sandwich. The avocado dressing that I made yesterday seemed a good substitute for her dressing and then I changed some other ingredients. It reminded me a little of a mock tuna salad but I loved the added sweetness from the cranberries. After enjoying my sandwich, I then ate a freshly baked muffin. If only every lunchtime was so satisfying. 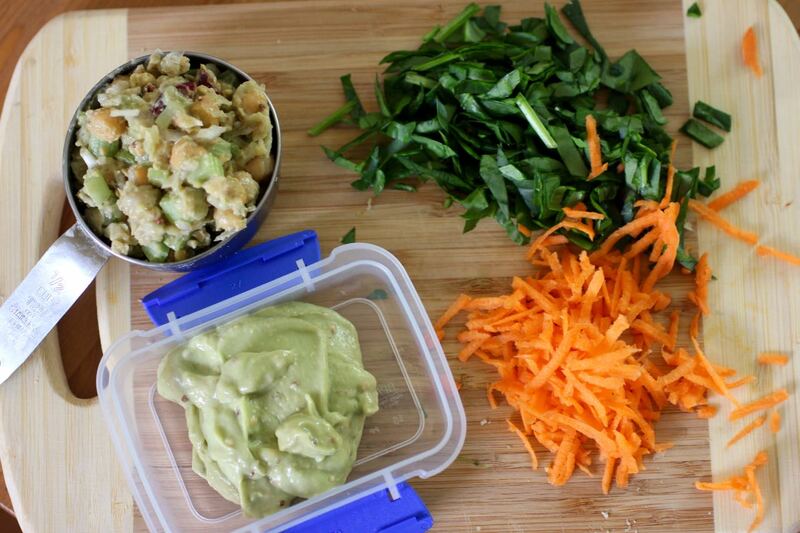 Make avocado dressing by whizzing up the ingredients in a food processor until smooth. 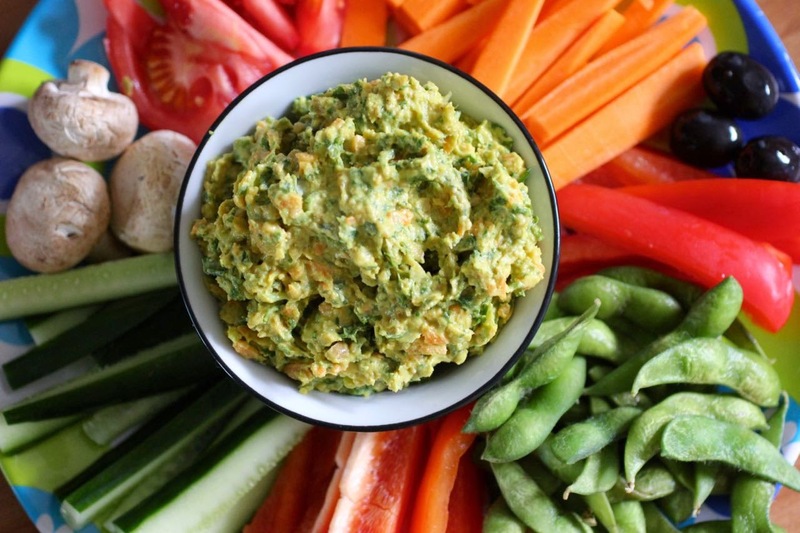 Make salad by lightly mashing chickpeas in a bowl and mixing remaining ingredients. 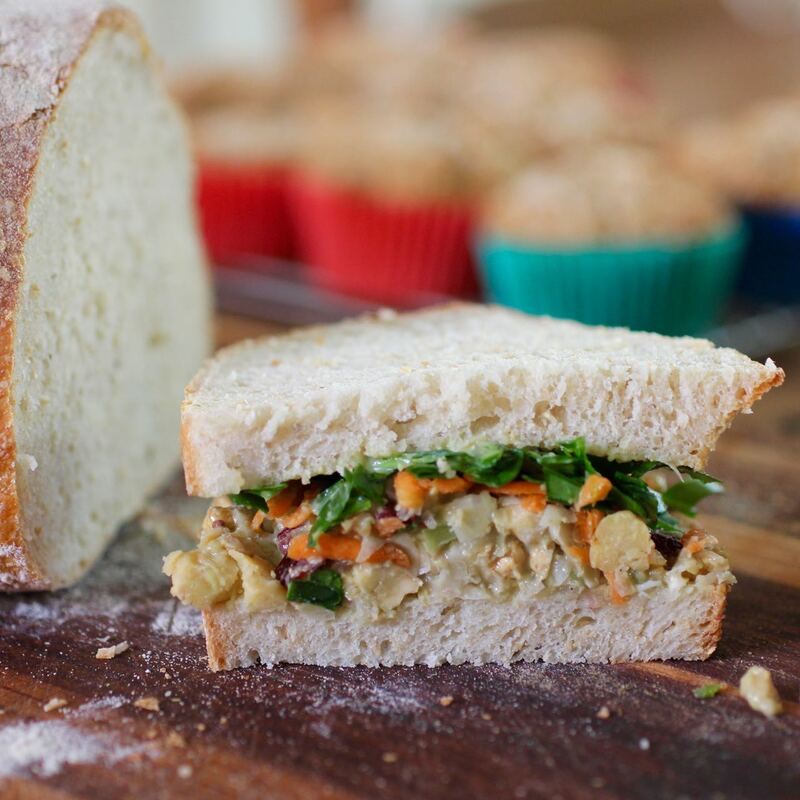 To assemble the sandwich, pile some salad on one piece of bread and use the back of the spoon to spread across the bread evenly. Pile on the carrot and spinach. Spread a little dressing on the other piece of bread and place on top of the vegies. 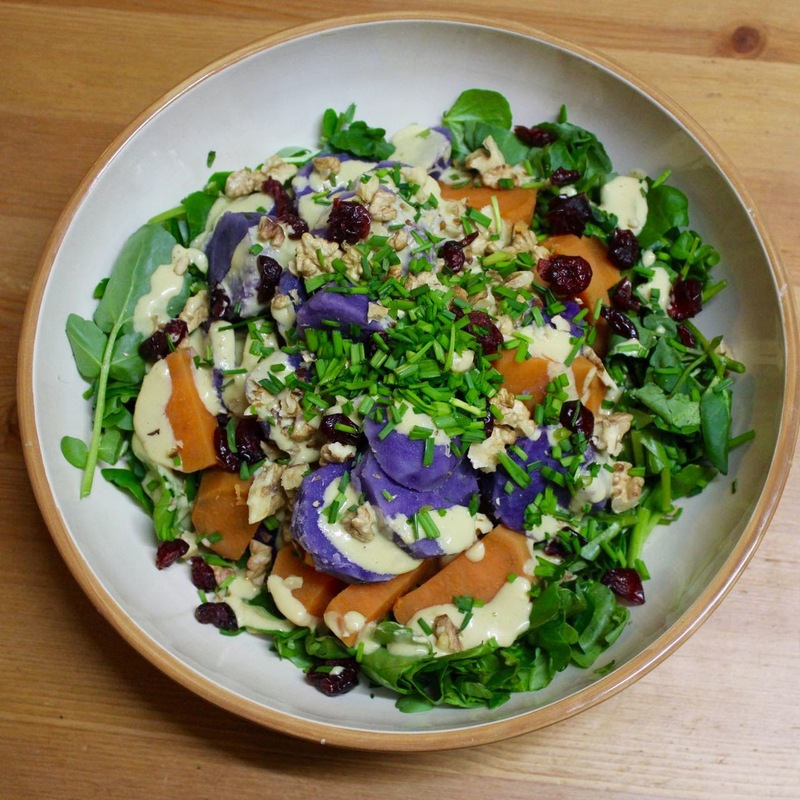 Update September 2016 - Made this salad with veganaise and a little mustard powder and lemon juice because did not have shallot and avocado dressing - was lovely. 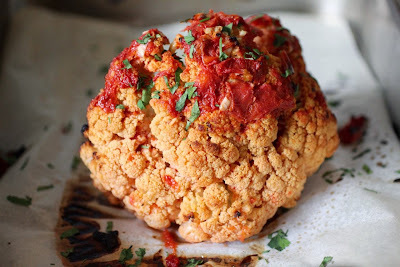 It is a terrible thing when the internet is exploding with tantalising recipes of whole baked cauliflower and the price shoots up to $6 per head. 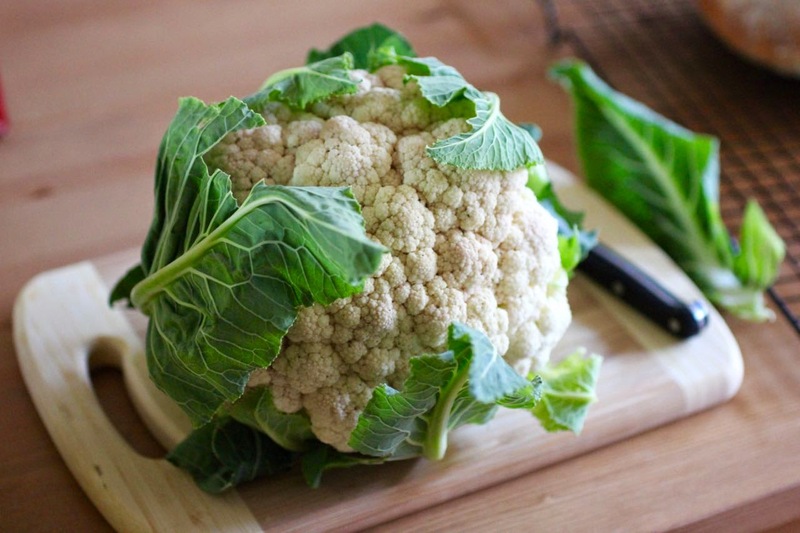 So when I saw the price of cauliflowers had fallen to $1.20 a couple of weeks ago, I grabbed one. And I knew exactly what I was going to do with it. It was to be baked. Well actually it was to be boiled first and then baked. I am not confident in my oven's ability to roast vegies until they are soft inside. Not when they are as large as a head of cauliflower. So I eased it in to the idea but boiling the cauliflower first. It also meant dinner came together a lot quicker. While there are many recipes for an Indian style yoghurt paste to be rubbed over the cauliflower, I really liked Bon Apetit's idea of boiling it in a seasoned liquid. But I preferred Jamie Oliver's tomato flavours. Plus I have lemons and herbs in the garden which went into the mix. I chose a rather small saucepan that just fit the cauliflower. It didn't require as much boiling liquid as my large stockpot. Once tender, I carefully transferred it to a roasting dish and spooned tomato over it. I looked for a suitable serving dish and was not confident in any of my pretty dishes to withstand high oven temperatures. So I stuck to stainless steel. My cauliflower was soft enough that it just needed to crisp up around the edges. After 20 minutes I thought to spray it with oil. I think this helped. Once cooked I found that the flavours of the seasoned liquid pretty much came through. Which meant that I didn't need to make it quite so salty. I think the 3 tsp of salt were too much and would reduce this to 1 to 2 tsp. Otherwise I really liked it. 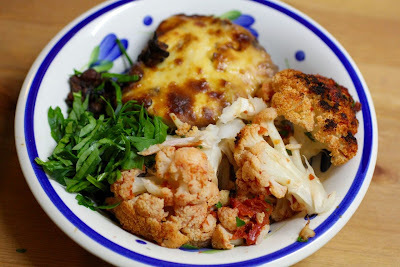 I served it with a moussaka that my mum had made for me. The next day I had some at room temperature for lunch with crackers and hummus. Then we finished the last bit by chopping it up and adding it to soup. 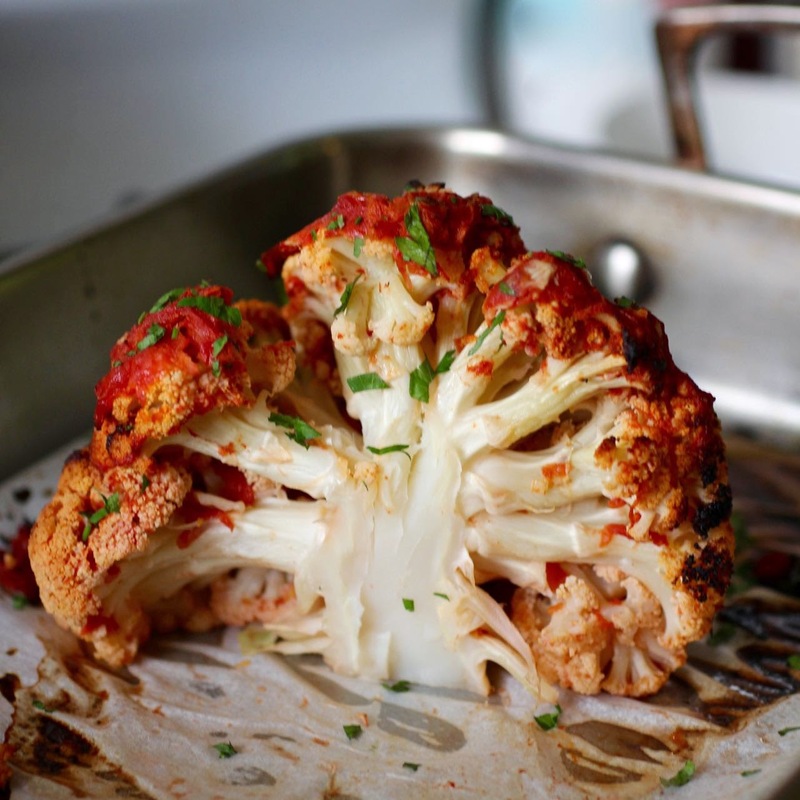 I am excited about how good the cauliflower tasted when cooked this way. It is a nice light way to cook a side dish that is good enough to eat by itself. The Bon Apetit recipe called for dipping the florets in a creamy goats cheese. I am sure it would work in other dips or with other sauces too. I still would love to try roasting the cauliflower from raw because it gives such a lovely flavour. However I am really pleased with this for now, especially with all the flavour the broth imparts. 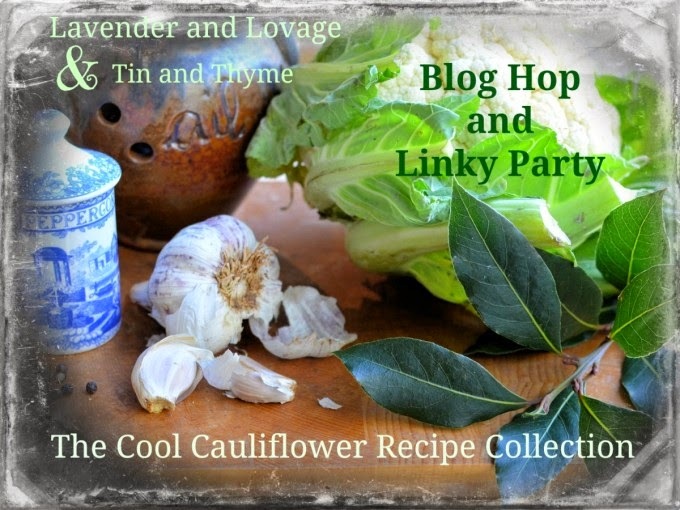 And I am delighted to be able to send it to Karen of Lavender and Lovage and Choclette of Tin and Thyme for their Cool Cauliflower Recipe Collection. 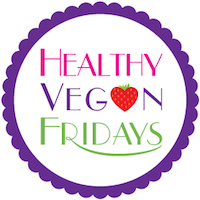 I am also sending the dish to Kimmy at Rock Your Vegan Socks for Healthy Vegan Fridays 49. Trim cauliflower of greenery and wash. Preheat oven to 240 C.
Place remaining ingredients (except oil spray and parsley) into a large saucepan that the cauliflower fits into. (The snugger the fit of the cauliflower, the less broth is needed for cooking. However it does make it a bit harder to maneouvre the cooked cauliflower out.) Taste and adjust seasonings. 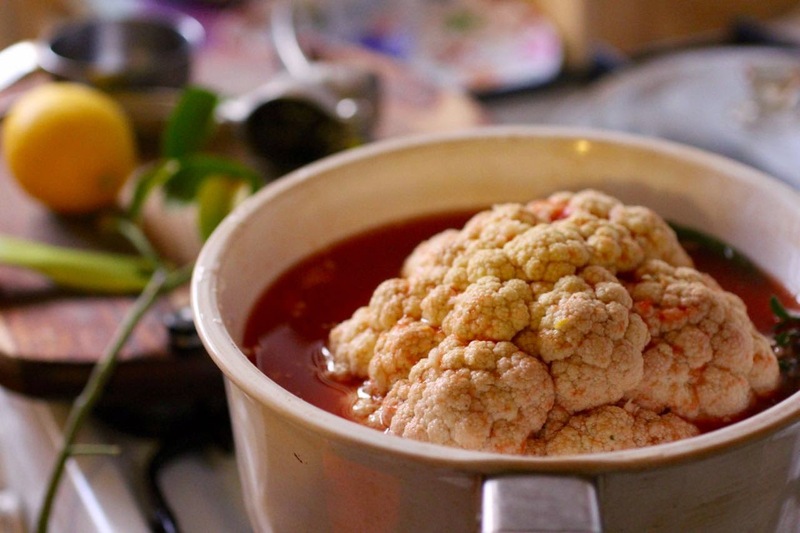 I found that the taste of the broth was strongly present in the final cauliflower. 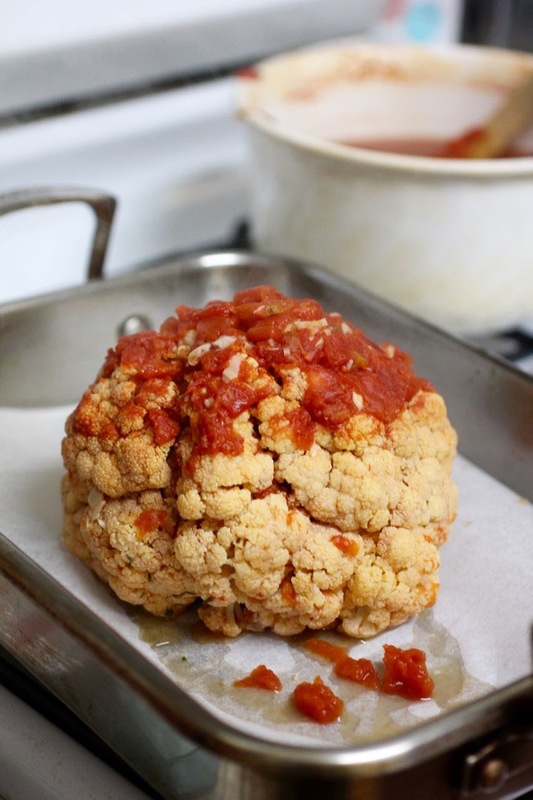 Bring to the boil and simmer for 10 to 15 minutes until cauliflower is just tender when a skewer is pushed into the middle. 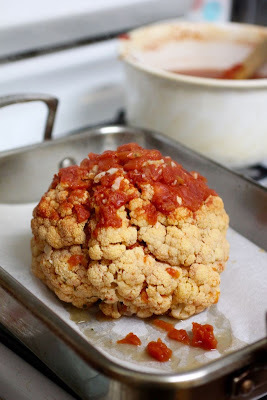 Bake cauliflower for 30 minutes or until it is slightly charred. Scatter with parsley and serve in wedges. Of all the stone fruit, plums are the ones most likely to find their way into baking in my kitchen. 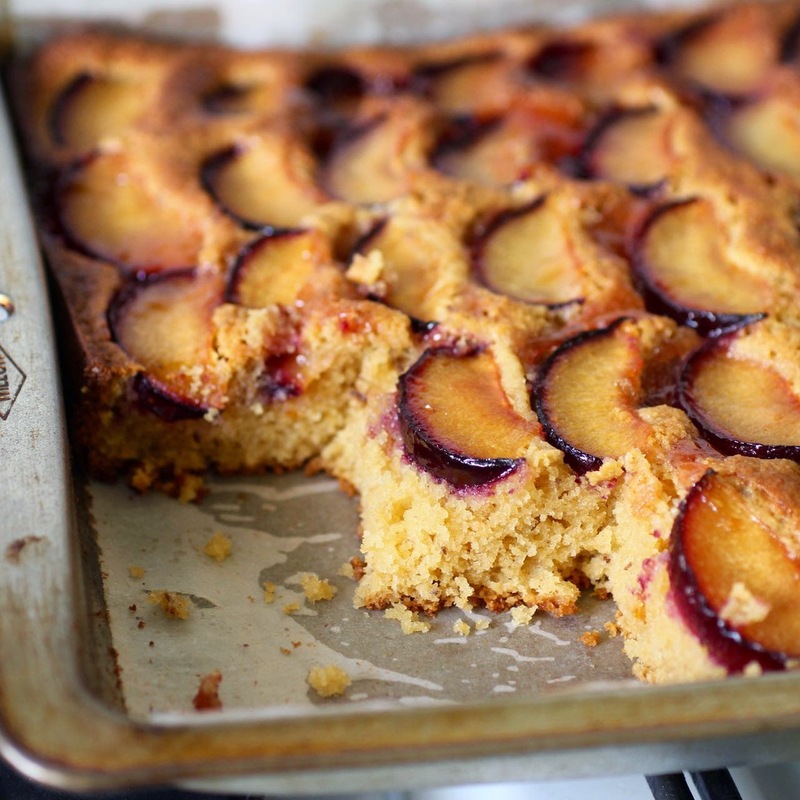 They are the last of the stone fruit, signifying the end of sunny days. 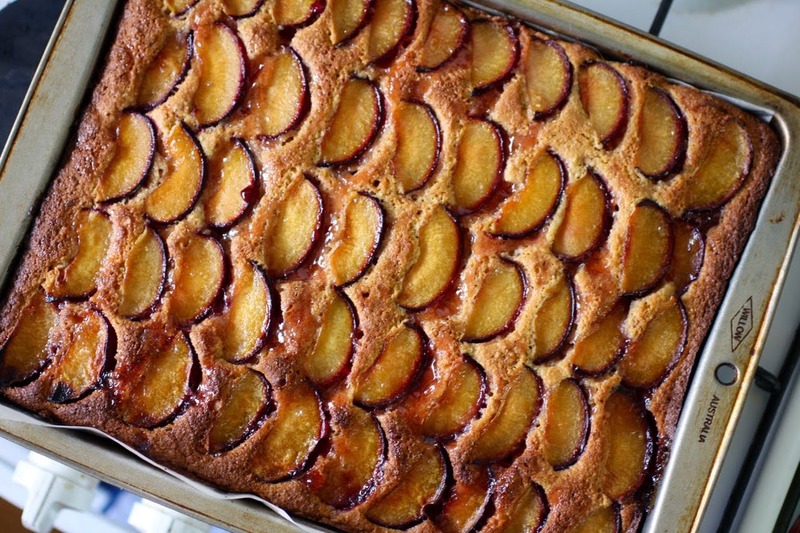 As the days become cooler and the nights draw in, the last of the plums go on sale and offer one more taste of summer. This year I made plum cake with a quince jelly glaze. I had been taken with a Raspberry and Quince Jelly Teacake found on Celia's Fig Jam and Lime Cordial, who in turn was inspired by the River Cottage Autumn television show. 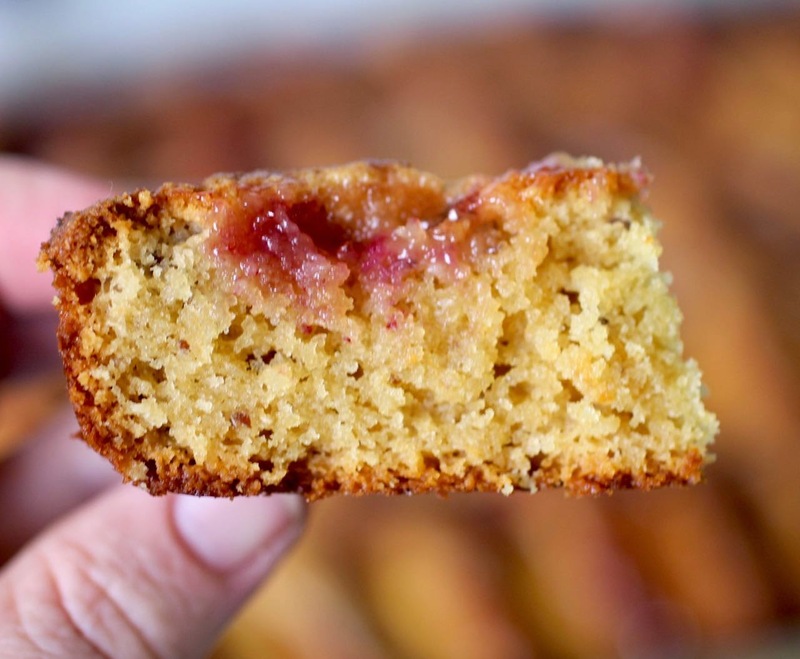 I loved the idea of glazing a cake with quince jelly that my mum makes each year. It was one of those recipes that I knew I would try sooner rather than later. I made changes: less eggs, some wholemeal flour and substituted brown sugar for castor sugar. I found myself searching for substitutes as I wanted less eggs and didn't have enough butter. I used some yoghurt, some linseeds and some extra baking powder to replace the egg and some more yoghurt instead of some of the butter. Then I discovered I had misread the oven temperature too and baked it at 160 C instead of 180 C.
It wasn't quite as yellow as Celia's cake but it was a lovely cake to eat with a cuppa on a blustery autumn day. I had plenty more plums left and made chutney with them. Then I regretted that there were no more plums until next summer. I will miss them. Plum and poppy seed muffins - Where's the Beef? Grease and line a lamington tin (13 x 9 inch). Preheat oven to 160 C. Cream butter and sugar. Beat in eggs. Gently stir in yoghurt, flour, almond meal, linseeds and baking powder. Scrape into prepared lamington tin. Arrange plum slices on top of the cake batter. 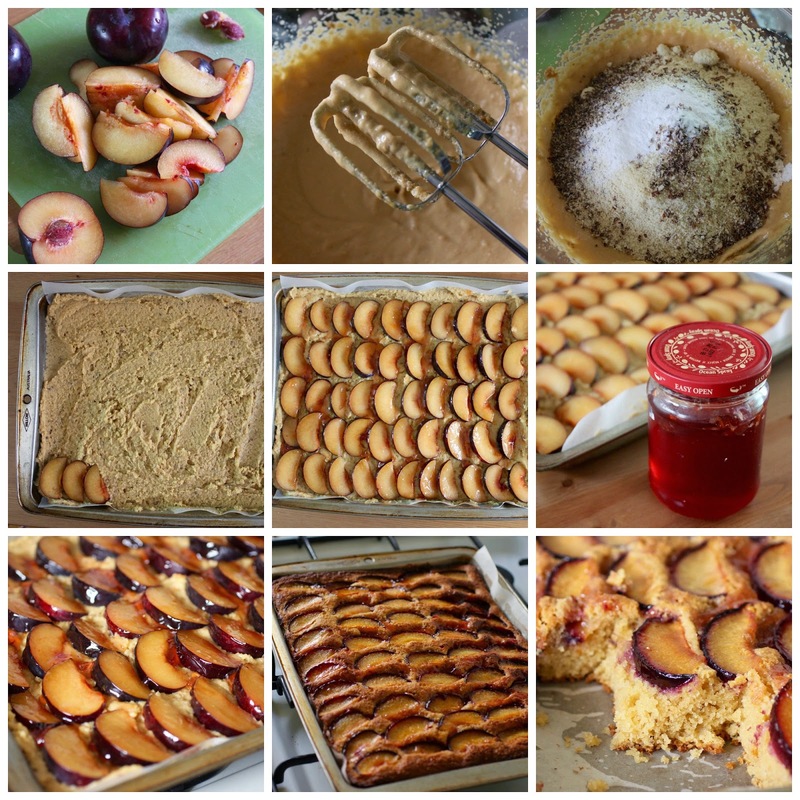 Generously brush the quince jelly over the plum slices. Bake for about 50 minutes or until golden brown and a skewer inserted in the middle comes out clean. Cool in the tin. Keep in an airtight container for three to five days. After making my ombre potato and cheese torte I still had purple potatoes left in the kitchen. The difficult decision of how to feature them was made easier when I bought watercress today. 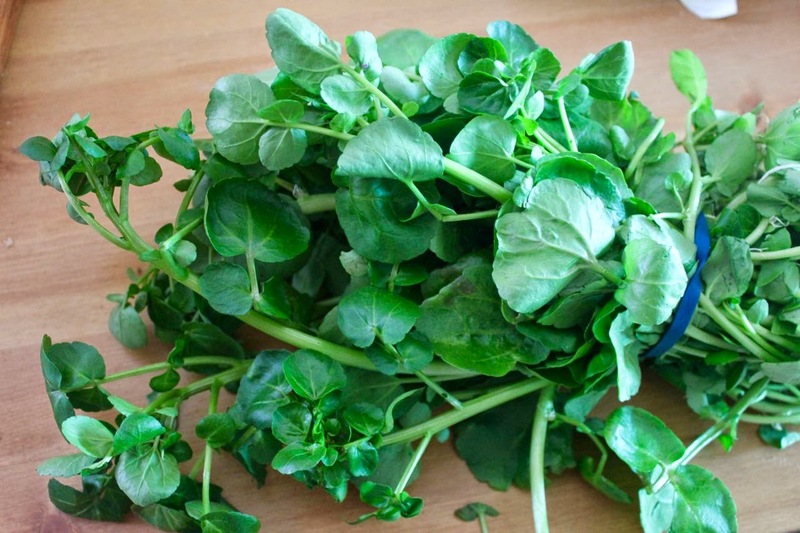 While I have used it in soups previously, watercress is really great in salads. The watercress was freshly picked from the CERES gardens when I bought it. How could I resist! I sat with friends tasting the fresh leaves while we had a coffee. At home I wondered what to do with it. Watercress is even more bamboozling than purple potatoes when it comes to recipe ideas. The watercress went into a salad sandwich while I searched for ideas. Finally it was a potato salad that took my fancy. 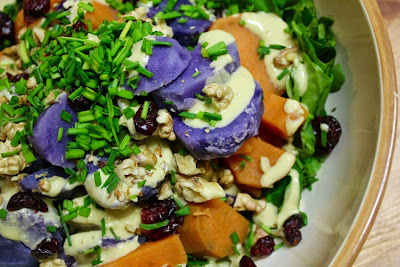 I found a recipe for arugula, brie and purple potato salad. 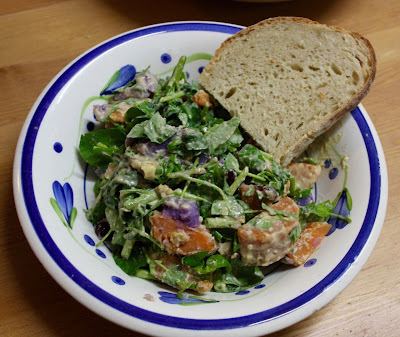 My vegan salad used a creamy cashew dressing and was quite different to the one that inspired it. I had freshly shelled walnuts from a farmers market and a lime from our tree. It was a slightly more complex dinner than I had envisioned before I saw the watercress. 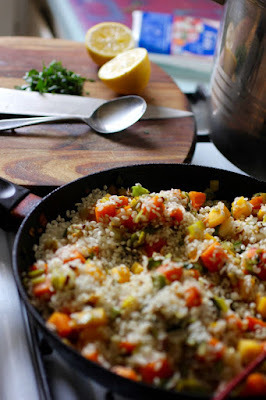 Yet it was still fairly easy to put together and all the flavours and textures worked well. Soft, crunchy, fresh, mustardy, creamy, and little nuggets of sweet. We enjoyed it for dinner with some fresh sourdough bread while relaxing after Sylvia had been to a school friend's party. 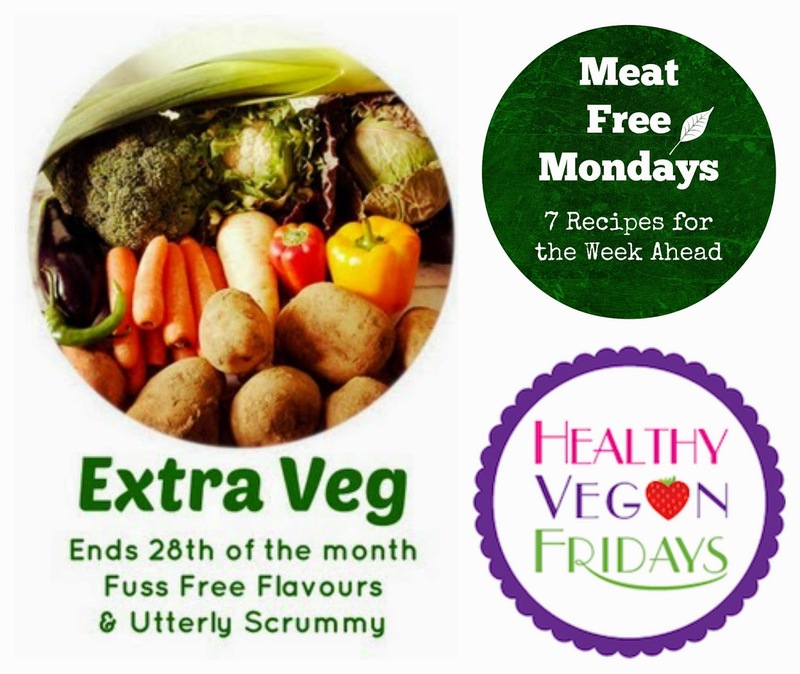 I am sending the salad to Jac for Meat Free Mondays, Kate for Helen's and Michelle's Extra Veg, and Kimmy for Healthy Vegan Fridays 48. I had planned to send it to Deb of Kahakai Kitchen for her regular Souper Sundays but I see she is on a blog break due to a bereavement so I send her warm wishes instead. Eight years ago: TGRWT #2 - It’s nuts, it’s bananas, it’s stew! Peel and chop potatoes into 1cm discs and cover with salted water. Cook until tender. Bring to the boil from cold water and then reduce to simmer. It took me between15 and 20 minutes from when I started the burner on the stovetop. Drain. Repeat with sweet potato in a separate saucepan. 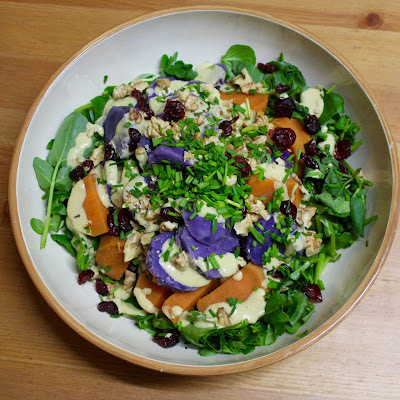 Arrange watercress and cooked potatoes in a salad bowl. Drizzle with dressing. 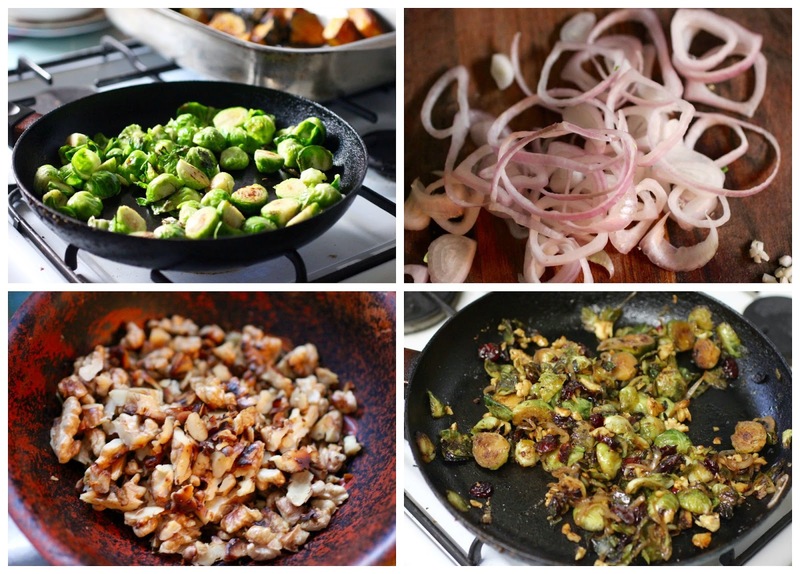 Scatter with walnuts, cranberries and chives. Toss and serve. We were talking about a child character in Wonder Woman who dreamt of man walking on the moon and how man had not yet landed there. Sylvia asked, "But had woman been on the moon?" Out of the mouths of babes! I had put on Wonder Woman for Sylvia and her friend on the morning after their sleepover. It seemed a good balance after they had watched some Barbie movie. After all every little girl will grow up to find they are expected to be Wonder Woman who can do it all, not just a pretty Barbie doll. Which is not to say that pretty things don't have their place. 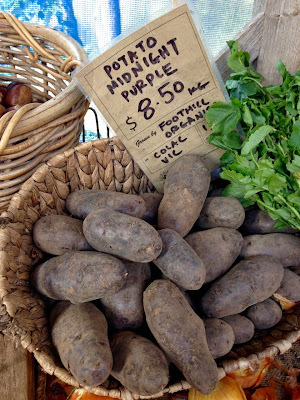 I had bought some purple potatoes at CERES and beetroot powder at my health food store. 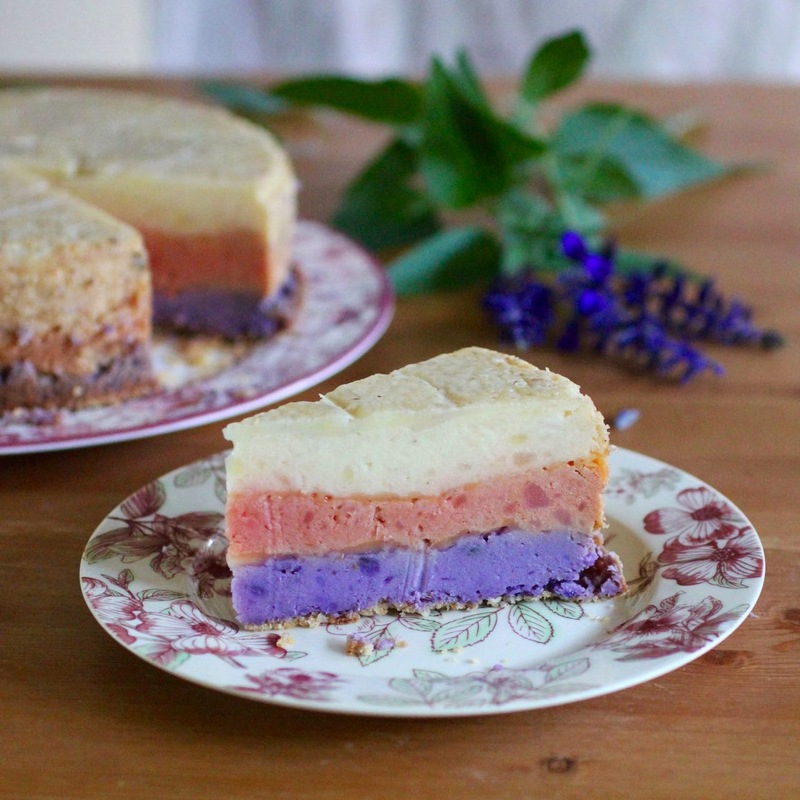 It inspired a vision of a multi coloured layered potato torte. And great excitement at the possibility. I am not sure it is technically 'ombre' because I don't know if purple and pink are similar enough but hopefully it is close enough for jazz. Despite searching online, the only suitable recipe I could find was a Potato and Cheese Torte from my pre-online handwritten notebook. 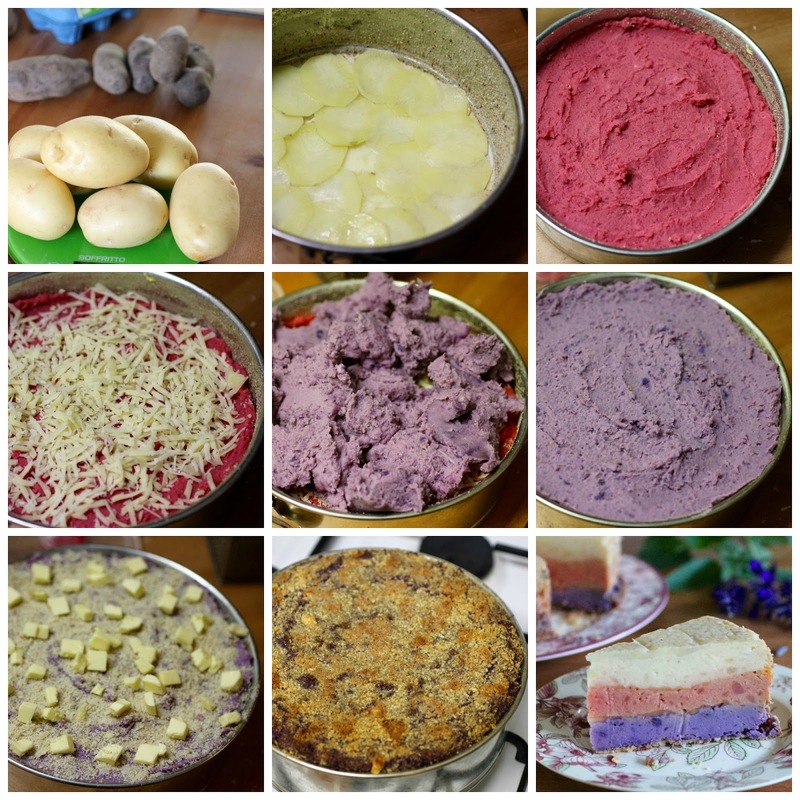 It is a simple matter of mashing potato with cheese and egg and baking it in a cake tin. I regret that when I took down the recipe years ago I didn't note the source. There are many variations on the idea. I changed my torte quite a bit from the recipe. I didn't use chives because they didn't suit the colour. I used some leftover cheese sauce and yoghurt instead of cream. I looked for gruyere in the supermarket but it was not to be found. I bought a goat cheese with truffle oil only to find it had anchovies in it. Finally I used swiss cheese between the layers. And in the future I have dreams of veganising it and making this with green layers of kale puree and perhaps a spinach puree. The recipe also suggested crisping up the top layer of potatoes but I didn't do this. I made the torte on Sunday night. It was really soft when it came out of the oven and I had visions of it collapsing into mush as I tried to cut it. So I left it overnight to firm up. The next day I was nauseous and couldn't face eating the rich torte. I was determined to get a decent photo in daylight hours so I took a few photos and then collapsed into bed. After all, it was unlikely I would make this torte again in a hurry. It has been on of those weeks. As well as nausea, I have had a sore back and a terrible headache. The car has been in service, we have had Numeracy Night at school, I have run around after a costume for Sylvia for her book week parade, we have had to buy new school shoes and birthday presents. And there is still swimming, walk to school day and a teddy bears picnic before the school week finishes. So I was very glad to have this torte to keep us going in the evenings. On Tuesday evening I made the side dish I had planned for Sunday: Brussels sprouts with walnuts and cranberries. 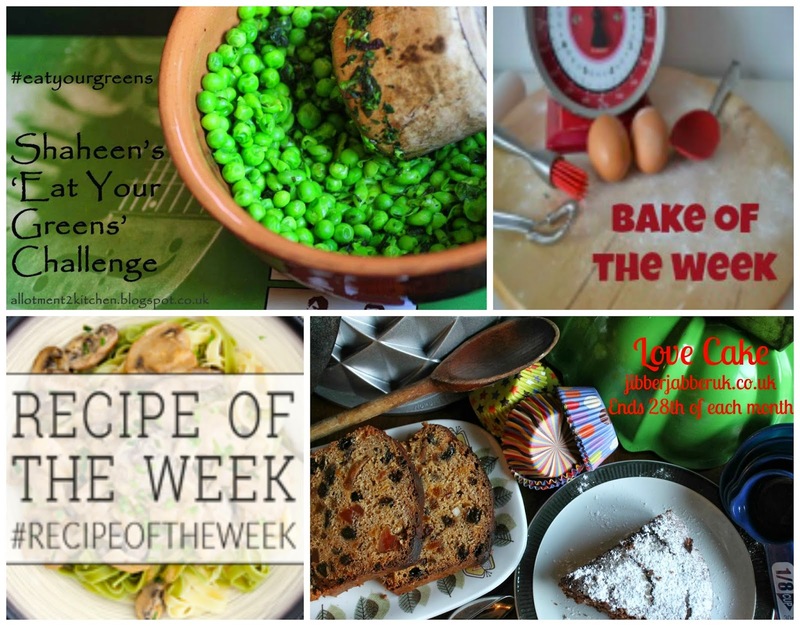 I hope to make it again and take more notice of the recipe before I share it. I also roasted some pumpkin. It made a really lovely meal. I would highly recommend this torte for a festive or fancy meal. It serves heaps of people and would be great on a buffet as it slices up well if you make it far enough ahead to let it set. However the torte is too rich to recommend eating by itself. It needs some colourful vegies or salads on the side and would be great with a gravy or sauce. We just had a chutney with it. I am very pleased with how this torte turned out. It looked pretty and tasted delicious. Even without coloured layers, this is a great torte to impress your family and friends. And it will make you feel like Wonder Woman. Though I am not sure that I ever saw her cook! Elizabeth's Kitchen for the Shop Local challenge because I used purple potatoes from CERES Farmers Market. Jac at Tinned Tomatoes for Bookmarked Recipes as I have had this recipe bookmarked in my notebook. 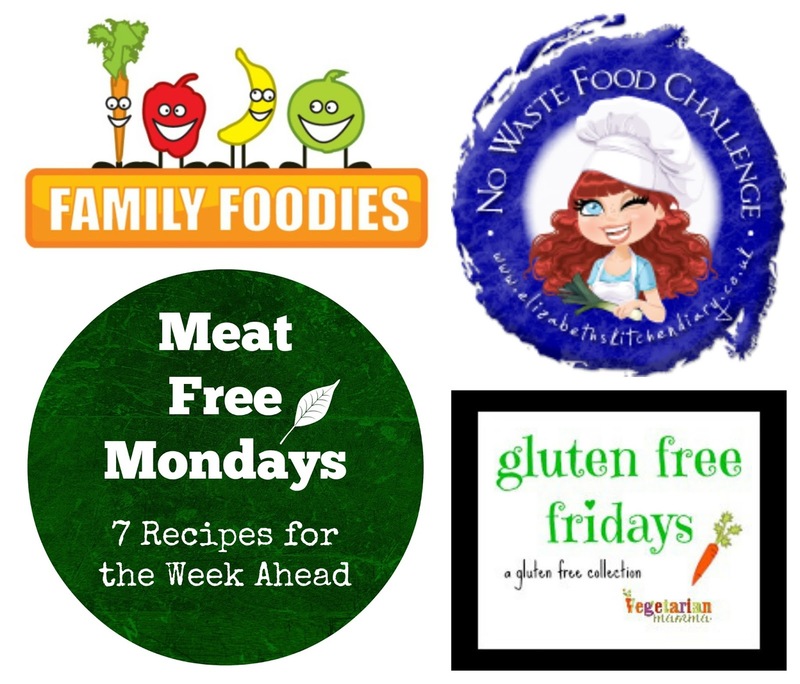 Cindy at Vegetarian Mama for Gluten Free Fridays #142. Angela at Patisserie Makes Perfect who is guest hosting Cook Blog Share, an event run by Lucy at Supergolden Bakes. Dom at Belleau Kitchen for his Simply Eggcellent challenge, which is savoury this month. I think the eggs help this torte keep its shape. Lauren from Create Bake Make, Lucy from Bake Play Smile and Dannielle from Zamamabakes for Fabulous Foodie Fridays #52. 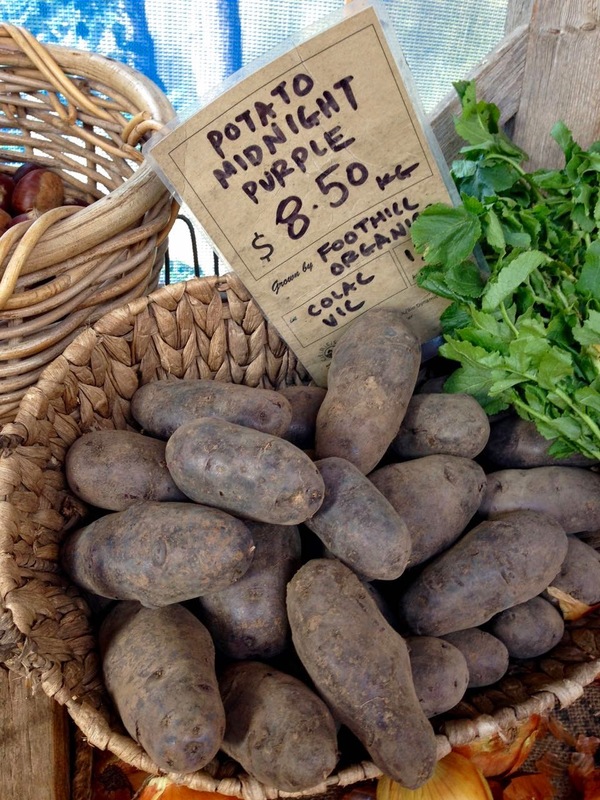 Place white potatoes in a medium saucepan and purple potatoes in a small saucepan. Fill each saucepan with cold water just up to the potatoes and add a clove of garlic and pinch of salt. Bring to the boil and simmer until tender. It should take about 15 minutes from when you start heating the potatoes and water. While potatoes are cooking, preheat oven to 180 C (I baked mine at 200 C to amend for my slow oven). Grease a round 22cm springform cake tin with a generous amount of butter. Line base with baking paper and grease paper well. Put a spoonful or two of fine dried breadcrumbs into the tin and tap them around until the base and sides of the tin is covered. Discard any loose breadcrumbs that don't cling to the butter. Drain each saucepan and return to a low heat and cook until all water has evaporated from the saucepan. Add two thirds of the butter, cheese sauce, yoghurt, parmesan, and eggs to the medium saucepan of white potatoes. Start with less of the yoghurt and parmesan. Mash potatoes and season (I used some chilli salt and wild garlic salt). Use a metal spoon to stir well and get some air into the mashed potato. Check and adjust seasonings and add more yoghurt if it is too stiff - if should be creamy enough to stir. Repeat with purple potatoes and the remaining ingredients (again starting with less yoghurt and parmesan and adding more if required). Trasnfer half the white mash into a bowl and mix in beetroot powder and smoked paprika. After mashing, stir in chopped chives, if using. Peel and finely slice one of the extra potatoes. 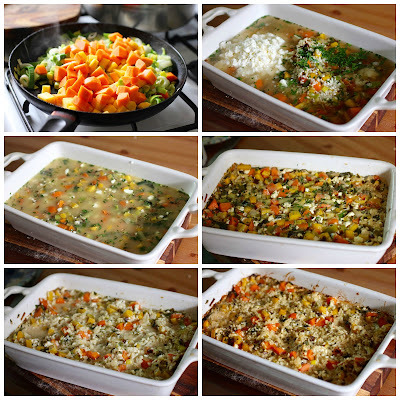 Cover with water in a microwave proof bowl and microwave for about 2 minutes or until bendy but not cooked through. Arrange the potato slices on the base of the prepared tin. Carefully spoon blobs of white mash onto the potato slices. Smooth the mash with the back of a spoon. Sprinkle with half the grated jarlsberg cheese. Repeat carefully spooning and smoothing the pink layer. Sprinkle with remaining cheese. Repeat the spooning and smoothing with the purple layer. Mix the breadcrumbs and parmesan for the crumb topping and sprinkle over the purple layer. Dot with butter. Bake torte for 50 to 60 minutes or until the crumb topping is golden brown. Cool in the tin. 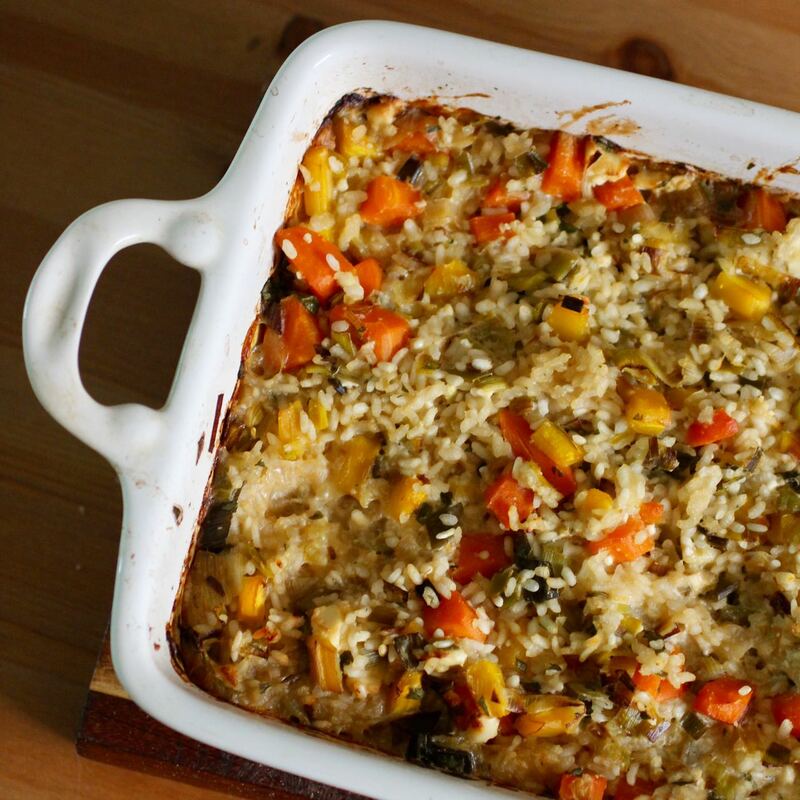 Turn out onto a serving plate, ideally one that can go in the oven. Reheat to serve or you could serve at room temperature. Lasts 4 to 5 days in the fridge. NOTE: to make it gluten free, use gluten free breadcrumbs. In September last year, I bought myself a new high speed blender. 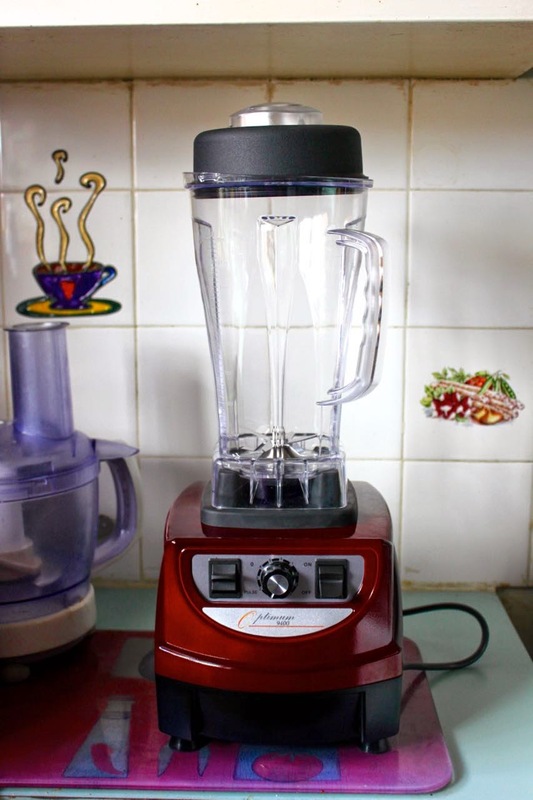 A Froothie Optimum 9400 blender. It was a major kitchen purchase and I wanted to write about it once I had used it for some time. I paid for it myself and love having it, but it has both good and bad points. I will write about these here for those who might be considering buying a new blender or just interested to know how I am using it. I was keen to buy a high speed blender after burning out the little blender attachment of my hand held blender. I wanted a blender that would make creamy sauces out of nuts, blend up kale into a smoothie and make smooth nut butters. 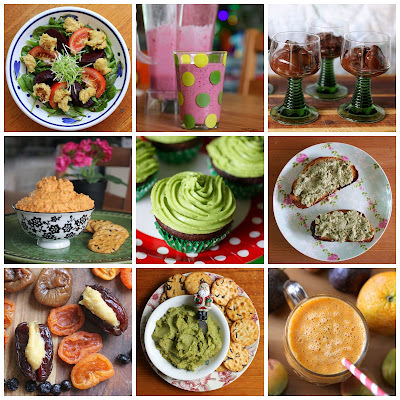 After all, I have made some pretty lumpy sauces, grassy smoothies and poor attempts at nut butter in the past. I have found the blender great for velvety smoothies and sauces. I have had a little more trouble with nut butters and dips which require more scraping down. One of my first nut butter attempts resulted in me overheating the motor. and having a greasy little knob of cashew butter (which tasted really good but was more cashew candy than cashew butter). I thought I had ruined my nice new blender. Once it cooled it was ok. I checked the instruction booklet and found I should be blending nut butter at a higher speed. A quick internet search also told me it is easier to blend roasted nuts into nut butter than raw nuts. Since then I have made quite a few lovely nut butters (with the tamper). I have learnt with the blender generally that I need enough ingredients that the blades don't whizz around with nothing to hit. The thicker the mixture the more likely it is that I need to scrape down the mixture a few times. If there is enough in the blender, using the tamper to push down ingredients is a great help. I love that I can make cashew sauces without having to soak the cashews though sometimes I need to add a little water to compensate. 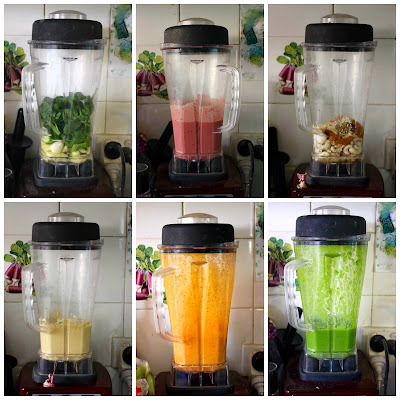 I have made lots of recipes I would not have been so confident attempting without a more powerful blender, though I also still make lots of smoothies that I could easily make with my hand held blender. 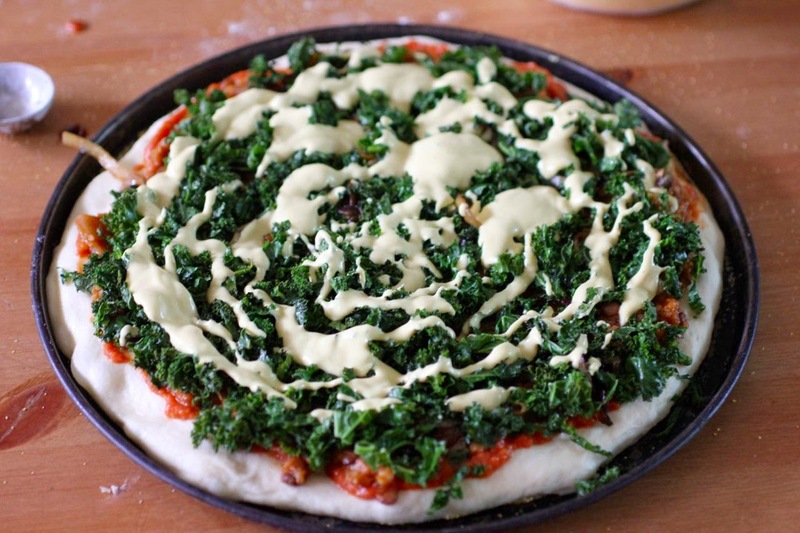 Above is a creamy Vegveeta cheeze sauce that I made to bake on a pizza with kale and tomato sauce. Below is a chickpea and kale sandwich spread that, while a little chunky, was far more blended that my previous blenders would have done. 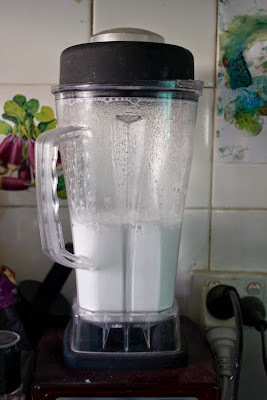 There are some aspects of the blender that I am not so keen on. There are three controls: an on/off button, a 1-10 dial, a pulse button. It seems counter-intuitive to have to push the on button up rather than down to start it and quite frankly that button seems redundant. I don't understand why the instructions say to always start the blender with the dial on low but you also need to hit the on button. I also don't find the lid easy to take on and off and end up popping it rather than screwing it. One of my other problems is a double edged sword. The bottom of the blender, unlike other blenders I have used, does not screw off for washing. I guess this is for sealing and because the blade is very sharp. The instructions say to put in water and a drop of detergent and blend. 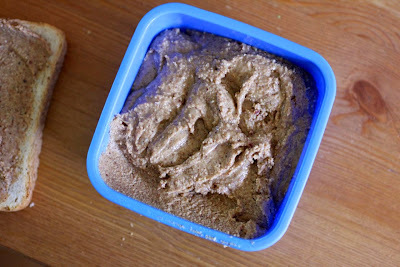 It is fine for a smoothie but when I make a nut butter I find it is best to soak or needs a lot of blending to clean it. Even with all the blending there are times I find to properly wipe out the blender. Especially when it is wet and I want it straight away for dry ingredients but have to wait for it to dry. On the up side, cleaning the blender this way means it is easy to clean quickly after I use it. My biggest problem is that I am not confident enough in the blender being completely clean. This is a big issue for allergies. I would love to make home made peanut butter but am worried there will be traces left that will get into Sylvia's food and set off her allergy. Overall I am delighted with my purchase. 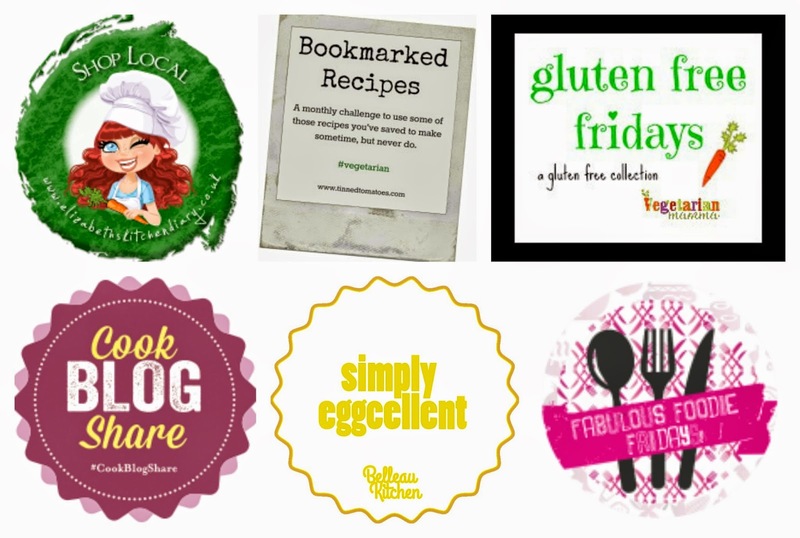 It has given me an ability to make foods I couldn't previous and more confidence with recipes. If I need a nut butter for recipes I can make my own. 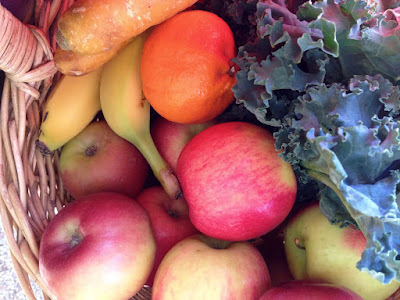 I can also put a greater mix of fruit and vegetables in my smoothies (though not pomegranate arils). I have ground nuts, oats and dried chickpea into flour in the blender. And I love being able to make such smooth sauces and nut butters. I use my blender a lot, if not daily. Thanks to Jac of Tinned Tomatoes for her recommendation. I would definitely recommend the Froothie Optimum 9400 blender if you are looking to purchase a new blender. I didn't sleep well on the eve of ANZAC Day. I went to bed early in preparation to rise at 4am for the Dawn Service but the two little girls in the bed did not want to sleep. My mind wandered to kale. Kale and cake competitions. 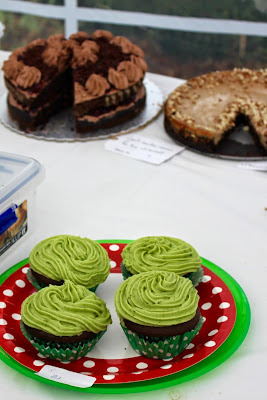 I had decided that kale cake would be creative enough for the bake off at CERES held by Animal Liberation Victoria as part of the Worldwide Vegan Bake Sale. But as I lay there mythoughts wandered to hidden fillings in chocolate cupcakes and what if it was green and cheesecake. Now that would be a challenge. The 4am rise on the Saturday meant I was too tired to make the cupcakes in the afternoon. They had to wait until the next day, the morning of the competition. No matter. At least they would be fresh. Unfortunately it left no room for mistakes or missing ingredients. Unfortunately it wasn't until morning that I discovered I had very little cocoa or vegan chocolate in the house. Fortunately I bake a lot of chocolate cakes. I was able to improvise with cacao nibs. I wanted to finely grind them in my good blender but as it was still wet from making the cheesecake mixture, they were roughly ground. The slight texture of the nibs actually worked well in the cupcakes. You might think me a bit crazy to attempt vegan cupcakes with a kale cheesecake filling on the morning of a cake baking competition when I had never made them before. Yet it wasn't quite a crazy as it seems. 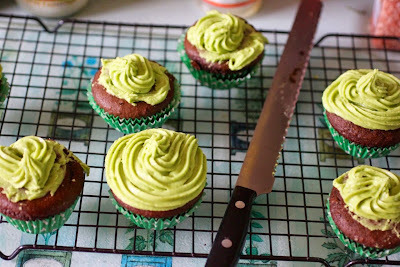 I was drawing on experiences of adding kale to scones to make them green, of making vegan cheesecake, of baking vegan chocolate cupcakes and of hiding something in cupcakes. 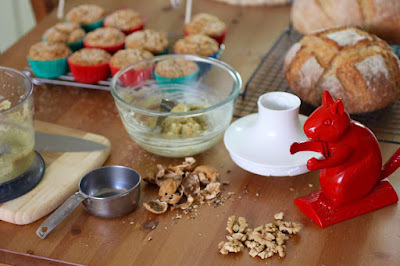 These previous baking adventures all contributed to my planning. While I make a lot of new recipes, they often build on previous experiences. 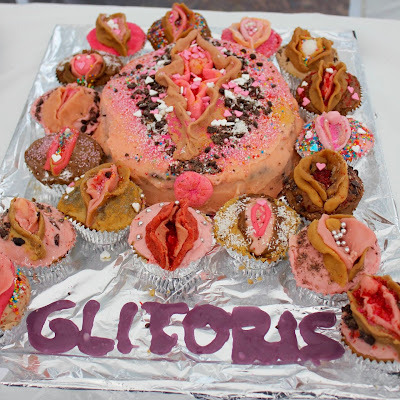 The icing had me stumped. I had mulled over whether to add green food colouring the previous evening. Then I realised the solution was staring at me in the face. 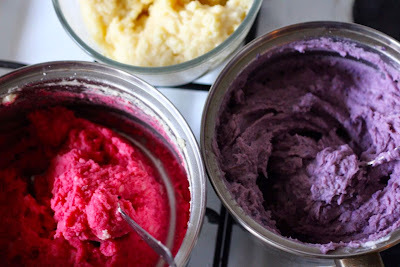 I had plenty of leftover cheesecake mixture which gave both brilliant colour and a great creamy texture to the frosting. I was happy that the frosting held its shape. As you can see above, I am a novice at frosting and had to try and try again. I didn't have quiet enough frosting so I had to keep reusing the frosting I had piped onto the dodgy cakes to try again with the unfrosted cakes. And though the swirls look so pretty, I prefer only a small amount of frosting on my cupcakes so if I wasn't making these for a competition, I would just spread the frosting on with a knife. By the time we had dropped Sylvia off for a play date and was heading into CERES with my cakes on a plate in the cake carrier, I was feeling like I had done a pretty good job. 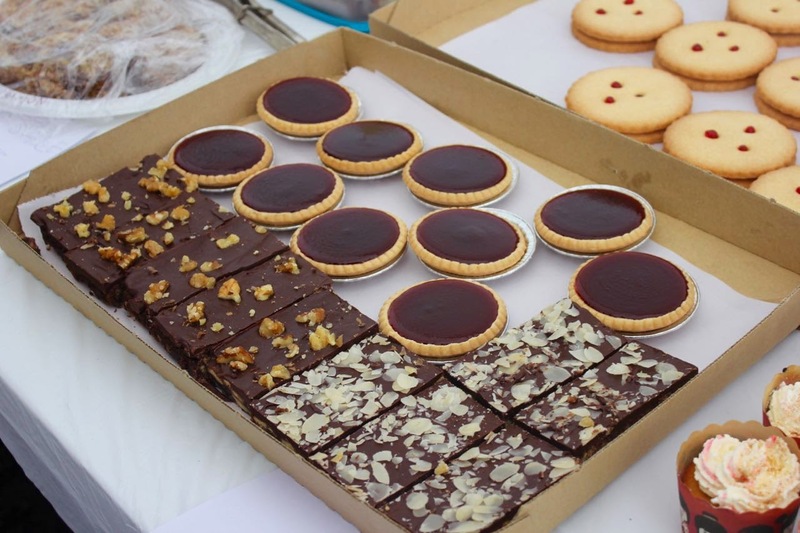 I had tasted the cakes and congratulated myself. I had only put four cupcakes on the plate because I had been told by the CWA lady at the last cake competition I entered that I shouldn't crowd the plate. And besides, I didn't have many frosted cupcakes that looked presentable. I lined up to register my entry and looked around at the competition with a sinking heart. 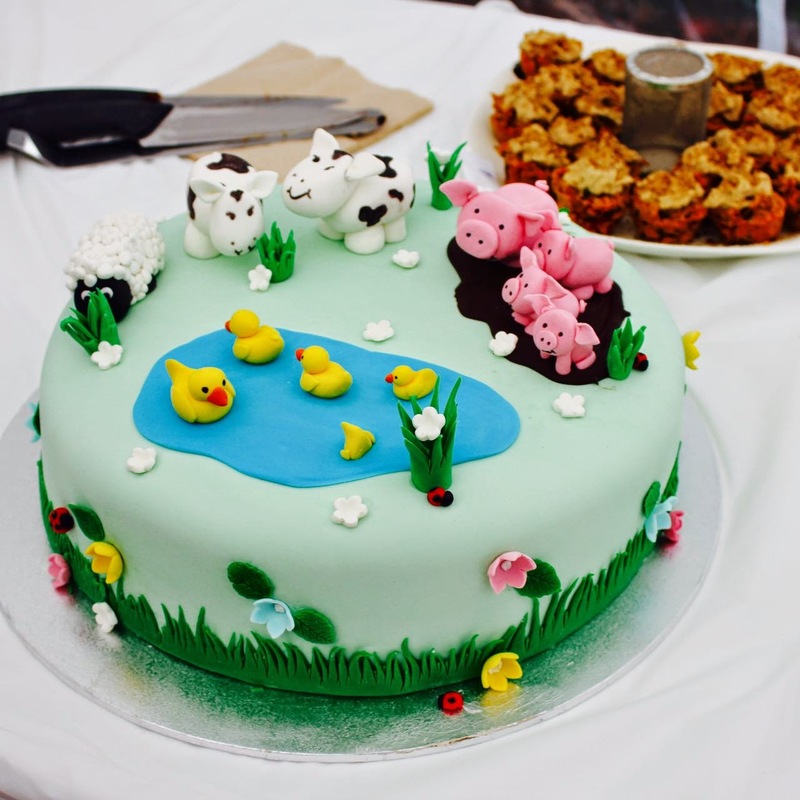 This amazing farmyard cake was actually a winner. 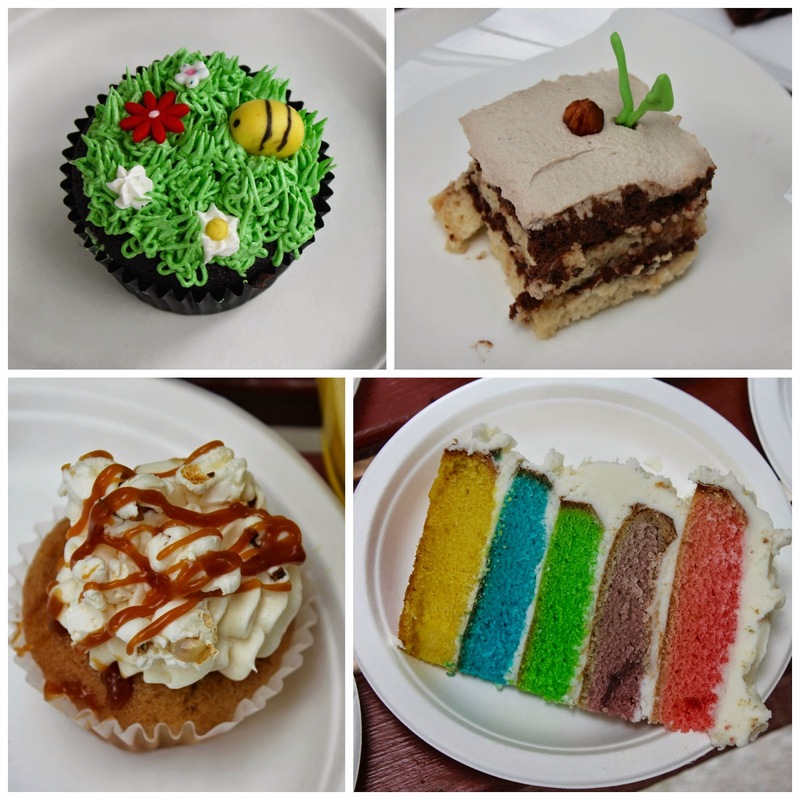 However there were heaps of entries of varying quality, some very beautiful, some very colourful, some very quirky and some just looked delicious. 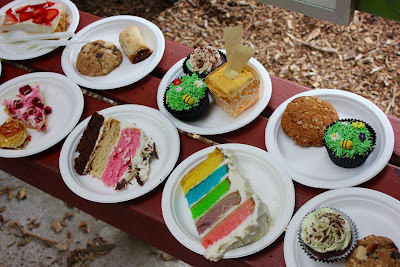 I wanted to take more photos but the organisers were keeping punters out of the area until the cake sale began. It was a rainy overcast day and not at all suited to taking photos, especially when under a marquee. So if you want some really good photos of the cakes and the day I suggest you head over to the post by Veganopoulous. I would have liked to have lingered and admire the cakes. 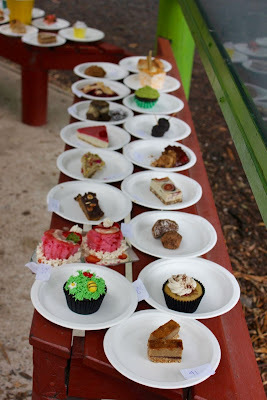 As well as those for the competition, there were heaps donated to help raise money. I really wanted some of the slices above but I just am not keen on queuing for ages for food. By the time the cake sale opened at 12 there was already a huge queue. We wandered off to watch a sausage making demonstration. 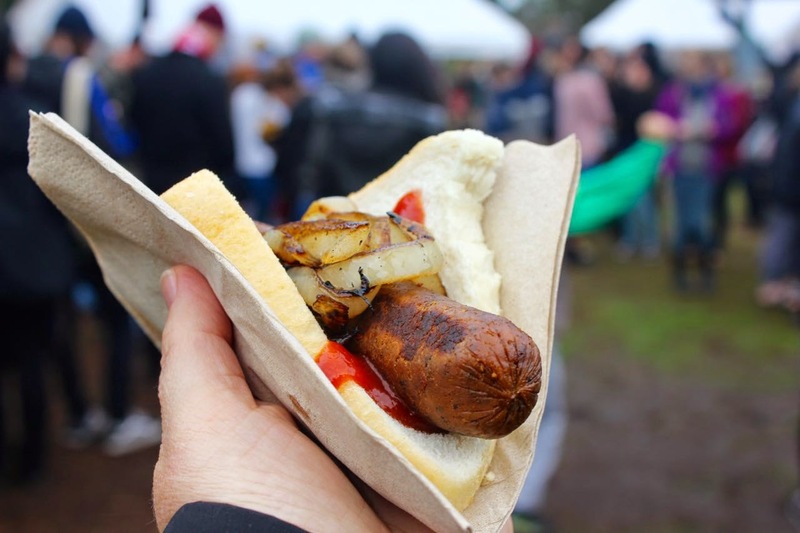 After that we found that there was even a queue at the sausage sizzle. We didn't have to wait too long to buy ourselves sausages. It was a treat to have really well cooked vegetarian sausages and a choice of three different flavours. I had the tomato one which was great. 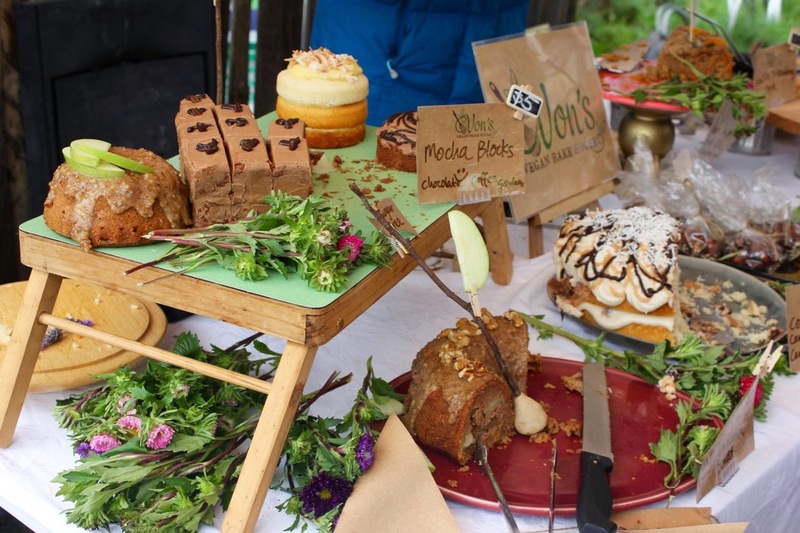 Rather than join the huge queue for the cakes we wondered over to the CERES marketplace where there were a few stalls selling vegan foods. I really loved the pretty display of cakes by Vohn's Kitchen. We had a coconut layer cake which was nice but I was disappointed that it didn't have dessicated coconut through it. When I was growing up 'coconut' always meant dessicated coconut. These days coconut can mean so many things. We sat and ate it in the courtyard by the market. It was really quiet after the busy cake sale area. We sat with a couple who had come to the bake sale but decided to have lunch in the marketplace. Apparently the lentil pie was really good. We also tasted the Damona cheeses (it seemed to taste a lot of coconut oil, which is not so much my thing though I know others love the cheeses) and some yummy Smooth as Fruit sorbets. I was curious to see the competition at the bake sale. A slice of cake or one cupcake from each offering was set out for each entrant and the rest of the cakes were then sold to raise money for Animal Liberation. I was pleased that I got an entry in even though the competition was tough. I had watched Agatha Raisin and the Quiche of Death the previous night in which the judge in a food competition was poisoned. Fortunately, I found that people really friendly at this event. It was great to see a few familiar faces. 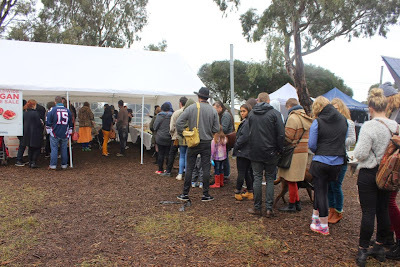 I spent some time chatting with Faye from Veganopoulous while she queued for cakes and while we chatting the line hardly moved. It made me even more sure that while I would have been eager to buy some cakes, I was not prepared to queue for them. By the time we had arranged to pick up Sylvia from her friend's place, I was ready to leave, even though we missed the judging. Kerin had been interested in the cupcakes and I remembered I had a couple of spare cupcakes in the car in case of an accident. So we took them into her house and cut them up to share. I am sending these cupcakes to Shaheen at A2K for the Eat Your Greens event, to Casa Costella for Bake of the Week, to A Mummy Too for Recipe of the Week and Jibber Jabber for Love Cake (Colour me Pretty). 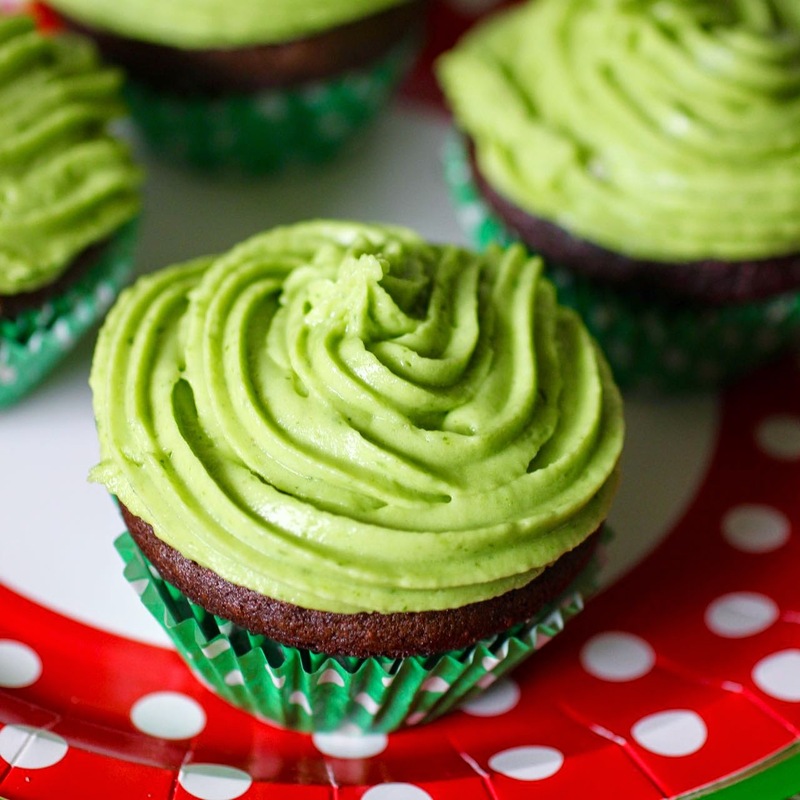 I am also sending these cupcakes to Kimmy for Healthy Vegan Fridays 48 at Rock My Vegan Socks. 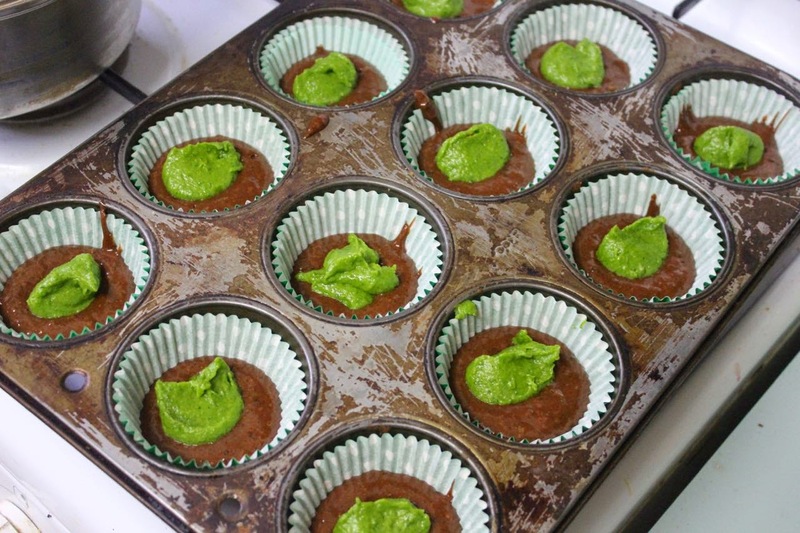 Preheat oven to 180 C. Line a 12 cup muffin tin with cupcake papers. 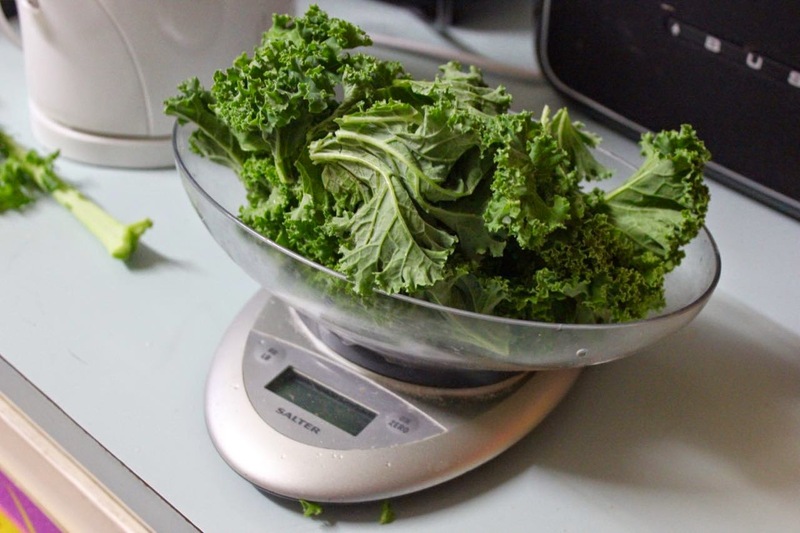 Make the cheesecake filling: Place kale in cold water in a saucepan. Bring to the boil and then rinse under cold water and press water out in a colander or sieve. Place with remaining ingredients in blender. Blend until smooth. Make cupcakes: Mix milk and vinegar and set aside. Mix flours, cocoa, grated chocolate, bicarb soda, baking powder and salt . Mix sugar and oil with the milk mixture. Pour wet ingredients into the dry ingredients and gently mix. Mix in cacao nibs. Spoon about a heaped tablespoon of mixture into the bottom of each muffin cup. Now spoon a heaped teaspoon of cheesecake mixture on top of the chocolate mixture and then cover with another spoonful or two of the chocolate mixture until you have distributed all the chocolate mixture evenly among the muffin cups. Set aside any remaining cheesecake mixture. 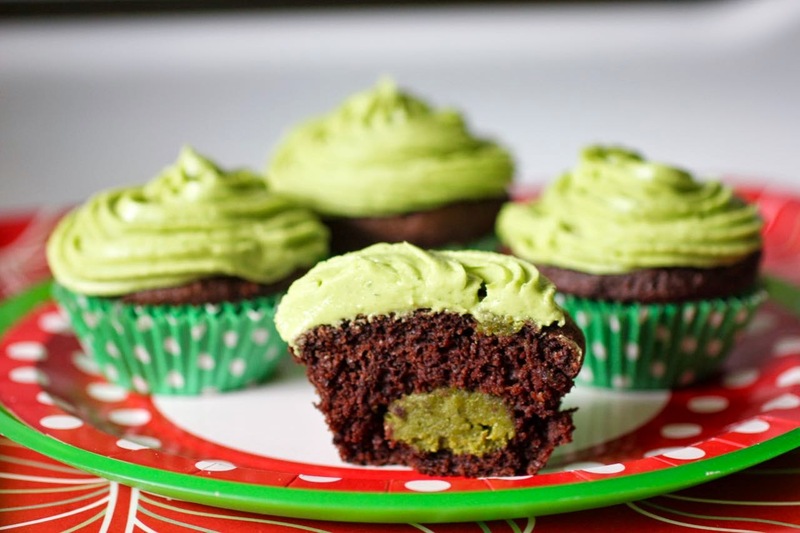 Bake for about 20 minutes or until cupcakes feel spongy to touch (rather than gooey). 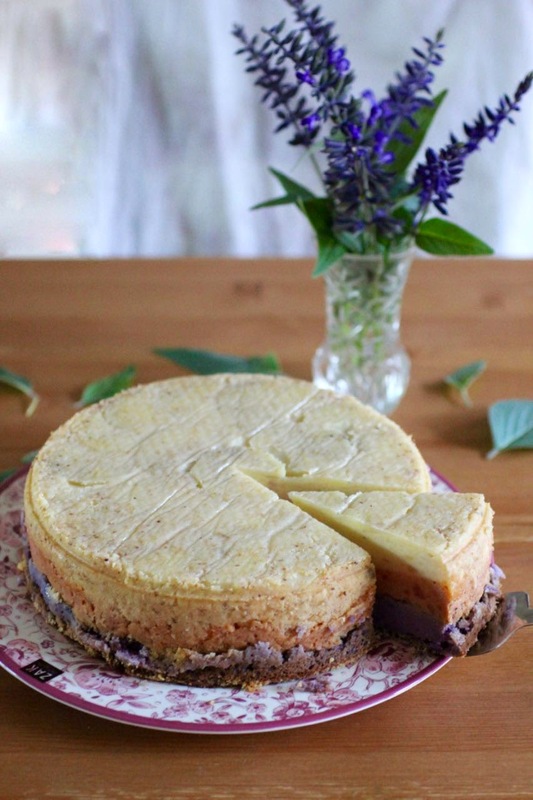 The cheesecake filling does not need to be baked through so it is a bit easier to make sure the outside cake mixture is baked. Cool on a wire rack. 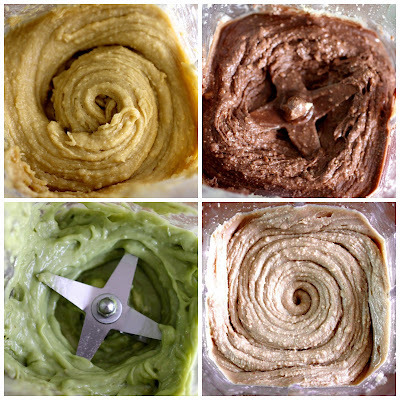 Make cheesecake frosting: Mix together enough butter and icing sugar to make a creamy icing. Then mix in remaining cheesecake mixture and some extra peppermint essence. This made enough icing to pipe swirly frosting on most cupcakes but might be too much if you just want to spread it on with a knife. NOTES: *I didn't have enough cocoa powder so instead of 1/3 cup cocoa, I used 2 tbsp cocoa, 40g dark chocolate and 1/4 cup ground cacao nibs. The cacao nibs weren't quite as well ground as I have hoped but it worked. I didn't measure out ingredients for the frosting so I have given approximate amounts.